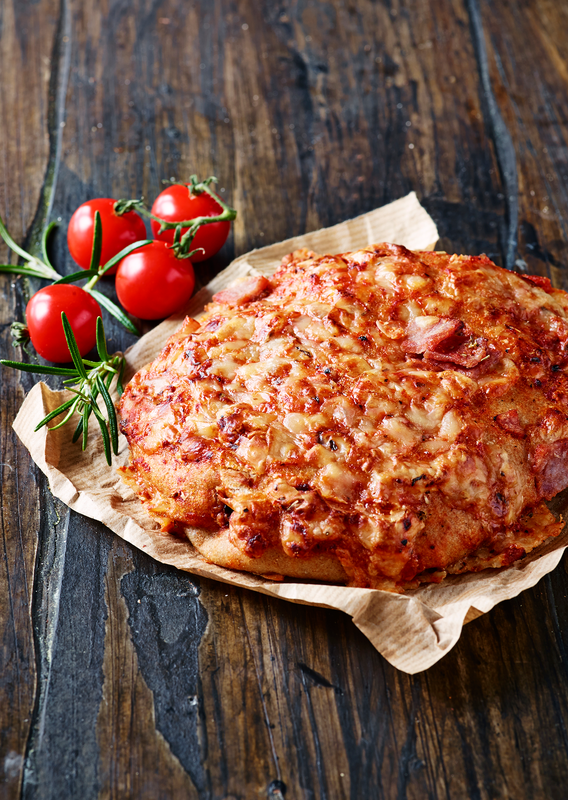 The focaccia is baked with the best raw materials based on sourdough and whole wheat flour (spring wheat) from Stenalt Goods as well as tomato sauce and topping. tomato sauce is based on delicious sun-ripened tomatoes added to them best flavoring spices and herbs as, among other things, ram onions, oregano, basil and rosemary. The focaccia is topped with delicious gouda cheese and ham. Spring wheat * 39%| gouda cheese * 16% (gouda cheese ( milk *| salt| starter culture| rennet) potato starch *)| ham| composed of pieces of meat 14% (pork * (89%)| water| dextrose *| broth * ( celery )| tomatoes * 14%| rapeseed oil *| yeast *| honey *| baking aid (dextrose *| thickener (E 412)| wheat flour *| wheat malt flour *)| salt added iodine| rye acid * (vinegar *| malt extract * ( barley malt *| water)| whole grain rye flour *)| pizza spice * (pepper *| oregano *| pepper *| basil *| coriander *| rosemary *| thyme *| onion *| mare *)| wheat starch *| cane sugar *| ram onion *| *= Raw materials of organic origin.